The UK’s preeminent video games retailer GAME transformed its 320 stores with digital signage that enhances the customer experience, reduces costs and allows GAME to respond more quickly to market shifts. All told, more than 1,300 BrightSign XD232 and XD1032 digital signage media players drive Samsung screens ranging from 40 to 55 inches across. 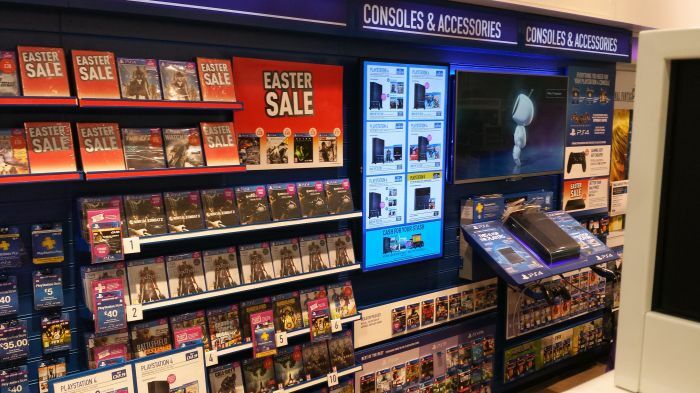 A display behind the counter plays video content from the latest games, while two other screens highlight the special offers available on the PS4 and Xbox. A fourth screen is deployed in the store window to attract foot traffic. Some of the larger, flagship stores feature perfectly synchronized BrightSign video walls for an even greater effect. BrightSign’s XD232 has a powerful video engine capable of dual full HD 1920x1080, 50/60p video decoding and simultaneous content playback from local, networked and streaming sources. Its abundant content support includes HTML5, 3D, and crisp upscaling of HD content to 4K. The BrightSign XD1032 offers all the capabilities of the XD232 and adds S/PDIF audio and, more importantly for GAME, extensive interactive options to captivate and engage customers with touch screen capabilities, for example. BrightSign Network Enterprise Edition (BSNEE) gives GAME a private network that can host all the content for the 1,300+ BrightSign media players. All BrightSign players installed in GAME’s stores and connected to the BSNEE are managed and updated remotely.